The limited number (28) of referral projects which passed through InTRO from August 2014 through May 2015 generally included somewhat ‘complicated’ needs. Comparing these requests to the larger numbers of service requests received by major providers, such as Center for Media and Educational Technologies (CMET) or A&AA Tech Services, suggests areas of consideration for improved faculty support going forward. A&AA Tech Services handled approximately 3500 help desk tickets in the last year. Of those 3500, about 750 (21%) can be categorized as related to instructional technology. 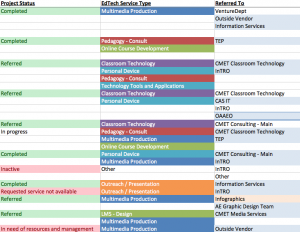 These ranged from questions about Course Folder (a server service for class materials and student projects storage), which made up half of the instructional technology related requests, to classroom support requests, to consulting with Sean Sharp (A&AA Educational Technologist) about technology for teaching. In AY 2014-15, the CMET responded to 4019 requests for support: 3253 for educational technology, 636 for classroom technology, and 130 for video services. But the initiation of the migration from Blackboard to Canvas–that is, the introduction of a significant, new technology application affecting all instructional staff–is dramatic evidence of the challenges to providing instructional technology support. 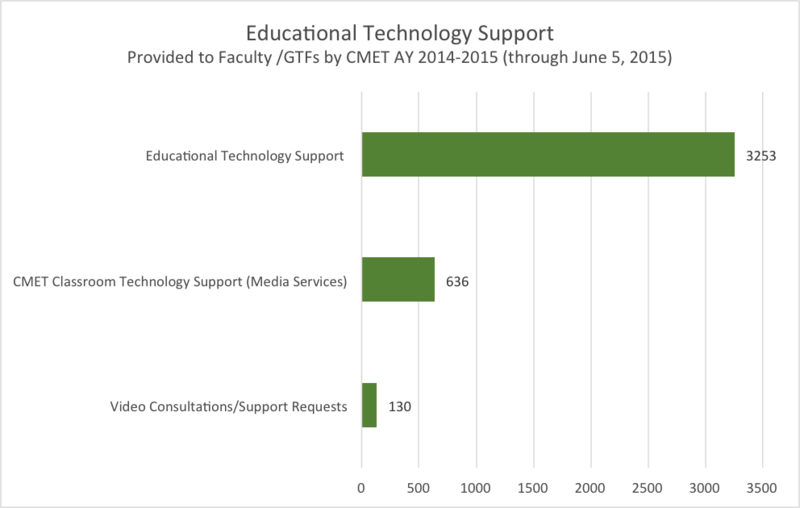 CMET historically responds to an average of 127 requests for educational technology support from faculty and GTFs each month. In preparation for the March 30, 2015 start of Spring term–the first term in which a number of instructors were teaching in Canvas–CMET responded to 569 support requests, 448% of the average. During April 2015, CMET responded to 387 more support requests, 305% of the average. During the launch period for Canvas (from roughly spring break through the first week of Spring Quarter 2015), only 62 requests concerned Blackboard usage, the rest were Canvas‐related training and support requests. See the Canvas Migration Project Status Update June 2015 [PDF] for complete details. Corresponding numbers, depending on the size of academic units served and on the introduction of new technologies, most likely can be found for other central and local service providers. Generally, this indicates that the large majority of instructional technology service requests are met through the activity of the multiple service providers on campus. In contrast, referral clients sought help from InTRO when they were unsure about where to find support; they might have known of the existence of various providers, but they were not aware that a specific provider could help with the kind of service support they needed to find. A significant portion of our referrals were made not solely to technology service providers (such as CMET or IS), but to related services (pedagogical development or personnel support). Eleven of the InTRO projects (39%) required referrals to multiple service providers. The need for referral assistance is less about having yet another office to seek out, and more about providing a single-point entry into the campus instructional technology service environment, with project or case management assistance for complex issues. A quick snapshot of some of InTRO’s RT data. You can also download our full data set as either a PDF or an XLSX file. Out of the 28 projects handled by InTRO, twelve referral projects were referred out and completed satisfactorily. Eleven more were referred out to service providers and most likely concluded successfully, but final status information was not available after InTRO’s involvement ended. Three projects stalled: one because requested service was not available; two others because the projects require additional resources and/or project management to proceed. Two further projects are inactive, waiting on client decision to reopen or take action. Clients contacted InTRO primarily remotely: Fourteen by email; four via the web-based service request form to the RT queue; and two by phone. Eight clients contacted InTRO in person, six of those during the office drop-in hours. Clients included tenure-track faculty (12), none-tenure-track faculty (8 instructors and adjuncts), one graduate teaching fellow, and program/administrative staff (7), which indicates a need for support across multiple segments of the campus community, with staff from individual programs making up an unexpected part of the total number. Projects were referred out for the following educational technology services: Multimedia Production (11); Online Course Development (10); Outreach/Presentations (6); Technology Support (5 Classroom, 5 Tools and Applications, and 4 Personal Device support), and Pedagogical Consultation (3). Other contacts ranged from general information inquiries, to an LMS design question, to a need for project management support to implement new instructional technology utilization. Projects also originated from across campus, including College of Arts and Sciences departments (15), the Clarke Honors College, the Lundquist College of Business (2), and the School of Architecture and Allied Arts (3), as well as individual programs and administrative units (7). Referrals were made to central service providers as well as school/college support units, including CMET, CASIT, Information Services, TEP, Academic Extension, The Digital Scholarship Center and other UO Libraries units, Obaverse, the Office of Affirmative Action and Equal Opportunity, as well as to a small number of outside vendors. Referral Circuit Diagram: A map of the connections InTRO made between faculty and service units, 2014-15. A gap between services available for instructional staff and those for students is apparent. Several referral requests for technology information and training for graduate students (both GTF and non-GTF) suggest uneven access and outreach to this segment of the UO community. AEI faculty remain an underserved group, possibly because of AEI’s position as an institute with a history of relative independence. Campus-wide support units have historically either been reticent to provide support or have found AEI staff a disproportionate drain on campus resources. With 70+ faculty teaching on campus each year, AEI faculty may continue to be perceived as a burden for service providers unless they are provided robust support through CASIT or alternative sources of support are provided. AEI support from CASIT has become regularized during AY2014-15 which should address this issue. There is also a gap in educational technology support for faculty appointed solely to the Clark Honors College. General IT admin support is available, and the Honors College staff provides some direct assistance for technology use in Chapman Hall classrooms. Nevertheless, these faculty lack the comprehensive instructional technology assistance afforded to instructional staff in UO’s other schools and colleges. Tracking of service requests, needs, and challenges within the ed tech environment at UO is made difficult by the inconsistent tracking of services across the many ed tech support units across campus. Request Tracker is a difficult application to use, designed primarily to track workflow, and dependent on significant programming support to utilize robustly. There are many high-quality tracking applications available on the market, which might be quite beneficial for improving service and ‘customer’ experience for faculty, staff, and students if implemented at an enterprise level.